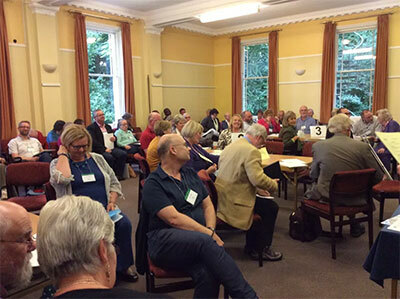 Over 60 people returned to the lovely surroundings of Woodbrooke Quaker Study Centre in Birmingham for the 6th annual conference, this time in early September. Uncertainty – “When we are certain we stop learning”. Pausing – American Indian wisdom says when you’re lost in the forest, don’t rush around searching for the path, but stand still and listen to the ground. Suspending judgement – “We judge ourselves by our intentions, but others by their actions”. Drawing from his personal experience he showed the difficulty of reflecting by ourselves without merely recycling our existing patterns of beliefs and attitudes. Fear is the enemy of reflection – “When fear enters the room, learning goes out the door”. He then went on look at spirituality in supervision, anchored in compassion and empathy, and worked out in relationship. The afternoon started with 3 short presentations on research projects in pastoral supervision by Dr Elizabeth Mann and Revd Richard Burge, Rabbi Markus Lange, Revd Ruth Craig. Accreditation Secretary, Maureen King and Chair of the Panel of Assessors, Diane Clutterbuck were on hand to answer any questions regarding accreditation. The Retreat Association, St Luke’s Care for Clergy, and Oxygen Insurance had stands. There was also a market place where participants could post publicity material. As usual, lunch and break times were filled with animated conversations and exchanges of backgrounds and views etc. From the feedback received, participants clearly valued the opportunity to meet with others engaged in pastoral supervision and enjoyed the buzz.